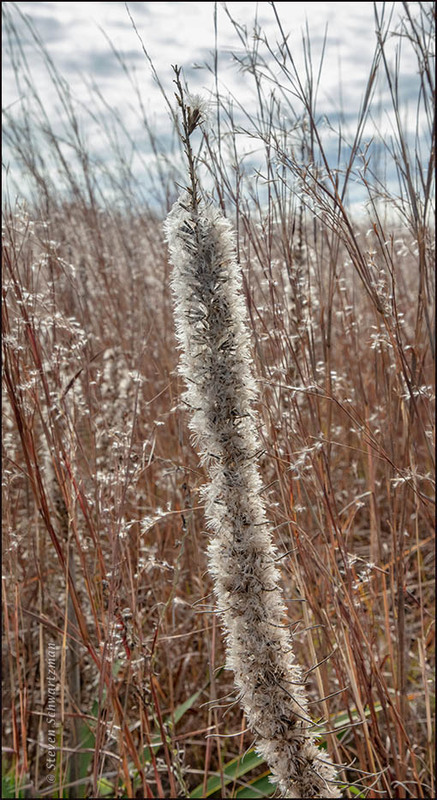 I didn’t see much blazing-star (Liatris mucronata) flowering in the fall of 2018. Maybe it wasn’t a great year for the species or maybe I wasn’t in the right places at the right times. On September 26th at the Lady Bird Johnson Wildflower Center I did get to make this bright portrait of a blazing-star flower spike contrasting with some prairie goldenrod (Solidago nemoralis) happily out of focus behind it. Several times in the months that followed I managed to photograph the late stage of this Liatris species, which often makes me imagine a fuzzy burned-out candle. Below from November 24th at the Doeskin Ranch is a picture of one with seed heads of little bluestem grass (Schizachyrium scoparium) surrounding it. from Edna St. Vincent Millay‘s A Few Figs from Thistles? A burned-out candle or a fuzzy pipe cleaner; either way it’s a lovely sight in lovely light. A pipe cleaner: why didn’t I think of that? Especially since my father used to smoke a pipe and had pipe cleaners around the house when I was a kid. I rarely see anyone smoking a pipe. That is probably a good thing. My father smoked a pipe for a short time. Then we have something else in common. While pipe cleaners worked on pipes, no one provided lung cleaners. Indeed not. They have may have been more useful than pipe cleaners. I’d never have thought of that, either, but now I see it. The young and the old: I think the late stage often goes underappreciated. This blazing-star is a such a beautiful, exuberant-looking flower, great! I agree that the early and late phases are photogenic, and for decades I’ve been portraying both. I like the combination of the lavender liatris and the golden(rod) background. Thinking about it, I suspect I might only have seen this species in Kansas. I’ve seen three species here over the years (L. acidota, L. pycnostachya, L. bracteata), but I don’t remember seeing any of them this fall. Odd. That late-stage photo with the little bluestem is gorgeous. Clever, how you framed it so the fuzz-less top of the liatris blends in with the grass stems, and the fuzziness has a nice background. I’ve also always wanted to read the first line as “My candle burns at both its ends;” I can’t imagine why Millay didn’t write it that way. 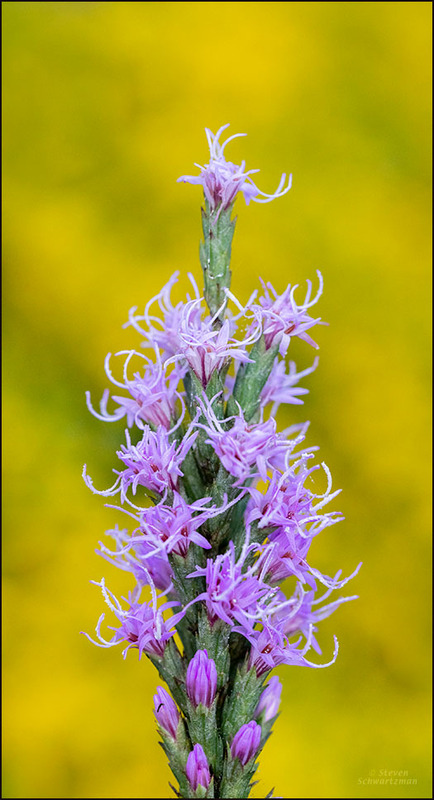 Liatris mucronata is the only species in the genus that grows in Austin. I forgot when I put this post together that the species has recently been reclassified as Liatris punctata var. mucronata. I’d also forgotten that it grows as far north as Kansas, where you saw it. A couple of other species grow a little to the east of Austin, in Bastrop, where I’ve photographed them. From what you say, maybe this past fall wasn’t a great season in Texas for Liatris in general. This is a plant Texas and Colorado share, Steve, but I have to admit that I have not consciously noticed its fuzzy late stages. Will have to pay closer attention next year! The fuzzy late stage of this species is one thing I became very much aware of when I first got into photographing native plants two decades ago. What made me aware was a whole colony that had turned fuzzy—a great sight. I only wish the digital camera I used had anywhere close to the quality and resolution of recent digital cameras. I can relate, Steve. I wish I had had a digital camera, even one with poor resolution, when we lived in Alaska. We took a lot of photographs with a conventional camera, and have saved and sorted some, but many more are in a pile without dates or locations, as we did not organize them as we should have. But the only way is forward, right?! Your last sentence reminded me of a slogan that was popular in Austin a couple of decades ago: Onward through the fog. You’re right that the metadata accompanying each digital photograph provides lots of information, most notably the date and time the picture was taken. Cameras in phones even give the location. That background is outstanding as is the capture of the flower. I like that you have contrasted the flower with its sere stalk. And I like that you used the word sere, especially in a phrase like “sere stalk” that matches my initials. Speaking of sere stalks, I’ve long been a fan of showing the various stages of a species. It occurred to me a long time ago that the late stage of something like this Liatris lasts a whole lot longer than the flowers, so those of use who go out a lot in nature end up seeing the late stage much more often than we see the flowers. As for the first image, it’s an example of something else I’ve enjoyed doing for a long time, namely contrasting one color with another. Texas has enough wildflowers that it’s not hard to play one in the foreground off agains another farther away. Oh, yes, that is a moving poem. The portrait of Liatris is spike-tacular. It is always fun to do forensic botanizing, isn’t it? Thanks! I’m not surprised to learn that sports prevail over botany. In the US they seem to prevail over everything, including sense. I learned the phrase “forensic botanizing” from a FWS pal. “In the US they seem to prevail over everything, including sense.” That’s been my experience. I once applied to a school district to teach high school math, and the first question that came up in the online application asked which sports I could coach. Oh, brother. That doesn’t surprise me. And we wonder why our children are falling behind those of other countries. Alas, I long since gave up wondering why. I know why.